The Canadian dollar continued its slide on Friday to a nine-month low as it marked its worst week against the U.S. dollar in over a year. It is already the worst performing major currency in the world this year. The Canadian dollar continued its slide on Friday to a nine-month low as it marked its worst week against the U.S. dollar in over a year. The loonie traded at an average value of 76.41 cents US on Friday, which was its lowest level since June last year and down over 0.4 per cent from Thursday's average of 76.73 cents US. It lost over 2.1 per cent against the U.S. dollar this week, which was its worst performance since early March last year. Canada's dollar is already the worst performing major currency in the world this year — down over four per cent. Disappointing manufacturing sales data, trade fears over NAFTA and the Bank of Canada's recent indication of slower interest rate hikes this week have weighed on the currency. Central bank governor Stephen Poloz gave a bright outlook of the "untapped potential" in the Canadian economy in a speech on Tuesday, suggesting he may wait to further tighten monetary policy and raise interest rates again after three hikes since July last year. "The outlook for relative central bank policy is turning increasingly bearish for the Canadian dollar as market participants adjust their expectations for the Bank of Canada in an environment of escalating trade uncertainty following President Trump's latest comments," said Shaun Osborne, foreign exchange strategist at Scotiabank, in a note. Osborne was referring to Trump's tweet on Thursday insisting that the U.S. had a trade deficit with Canada, after a recording surfaced this week of him boasting in a speech that he had made up trade deficit figures in a meeting with Prime Minister Justin Trudeau. "The comments from Trump have underscored the fact that this is going to be a fairly difficult negotiation for Canada and Mexico still," Osborne told CBC News. "Prime Minister Trudeau was sounding confident on NAFTA early in the week and then we had these comments from the president that suggest that it's still going to be a difficult jump to bridge the gap between probably what Canada and Mexico are willing to offer and what the U.S. wants out of this renegotiation process at this point." The impact on Canada from the potential collapse of NAFTA was highlighted by ratings agency Moody's on Thursday, which said that the export-reliant provinces of New Brunswick and Ontario would be hardest hit if an agreement was not renegotiated. Meanwhile, national manufacturing sales data released on Friday did little to support the loonie. Manufacturing sales in volume terms fell 1.1 per cent in January to $54.9 billion, with 14 of the 21 industries moving lower. The decline was led by the auto, aerospace and primary metal industries and exceeded the 0.8 per cent drop that was expected by economists polled by Reuters. "The further decline in manufacturing sales volumes in January, broadly consistent with the drop in non-commodity exports already reported for that month, provides further evidence that the economy began this year on a softer footing," said David Madani, economist at research firm Capital Economics. "Overall, the weakness in manufacturing continues to mirror the struggling export sector, which doesn't appear to have benefited much from the recent pickup in global activity and past depreciation of the Canadian dollar," he said. A weaker loonie should benefit Canadian manufacturers who export goods, and analysts are predicting that the currency may fall further. "The Canadian dollar remains vulnerable to further near-term weakness and the options market is pricing a greater premium for protection against Canadian dollar weakness," said Scotiabank's Osborne, referring to bets being made against the Canadian dollar by traders. 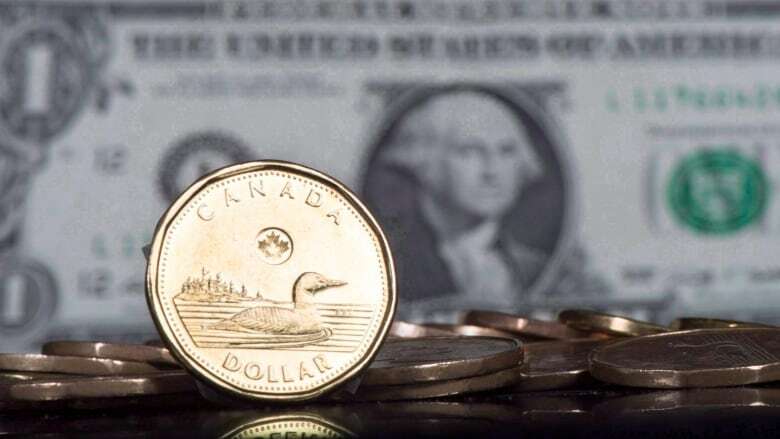 The likelihood of another interest rate hike by the U.S. Federal Reserve next week on Wednesday also does not bode well for the loonie, as the U.S. dollar usually gets stronger against a basket of major currencies after such a move. "The crux is that the market has been steadily ratcheting down expectations of rate hikes [from the Bank of Canada] at the very time when it is upgrading the amount of expected Fed tightening this year," said Doug Porter, chief economist at BMO Capital markets. "Looking ahead, it's clearly a challenge to find positive things to say about the Canadian dollar's outlook in this dark trade environment and the rapidly diverging view on North American monetary policy, not to mention the very real divergence on tax policies," he said. Osborne pointed out that the big decline in the Canadian dollar is not just against the greenback, but pretty much across the board. "For anyone thinking about vacationing in the U.S., it's not just a case of the U.S. looking a bit more expensive, but the pound sterling is at the highest since the Brexit vote in 2016 and euro-Canadian dollar cross is trading at multi-month highs as well," he said.